The enterprise communications industry is transforming fast. The trends that are redefining the space include the continued shift toward cloud, the embrace of team collaboration tools and workspaces replete with video and analytics, and the infusion of artificial intelligence (AI) into business communications systems and contact center solutions. These changes have shaken up the market landscape, bringing in new competitors to challenge incumbent leaders like Cisco. It’s not always easy for a company that led one generation of technology transition to repeat this success when the market shifts again, but that’s the challenge that Cisco faces. Having pioneered IP communications 20 years ago, Cisco now is attempting to defend its market position by rolling out a new generation of systems that emphasize network and application programmability, new solutions for team collaboration workspaces, and a growing focus on the contact center space and cloud UC arenas. And as the incumbent provider for many of the largest enterprises, Cisco’s strategic directions impact the market like few other players’. It’s also a time of leadership transition for Cisco’s Collaboration Technology Group. And Enterprise Connect Orlando 2019 attendees will get to hear about that technology and leadership vision when the person now in charge of it takes the keynote stage next March 20. 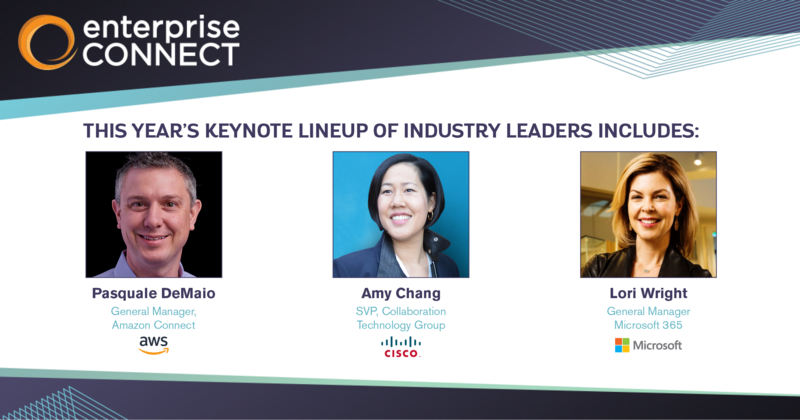 Amy Chang, SVP of Cisco’s Collaboration Technology Group, who came to the company through its acquisition of Accompany in May, will share her vision for addressing the disruptive changes taking place in the enterprise communications industry. Chang was founder and CEO of Accompany, a relationship intelligence company; in her role at Cisco, she is responsible for leading the Collaboration business, which includes the Webex suite of products, telepresence hardware and software, contact center, and unified communications. In addition to her position at Cisco, Chang serves on the board of directors for Procter & Gamble, and has previously served on the boards of Cisco, Splunk, and Informatica. In looking at the lineup of our first three keynoters, you might be noticing a trend -- one that I personally could not be happier about. We’ve got two female executives on tap to deliver EC keynotes this year. In an industry that’s still male-dominated, it’s not only refreshing to see more women on the main stage of the event, but important to advancing diversity for the industry. In fact, at Enterprise Connect this year, we’re continuing to build on our efforts to advance diversity and inclusion in the communications industry. In addition to a women’s networking event on Monday night, we’ll have a number of other functions and sessions on the program that are geared toward this mission. Of note is a session in our new Strategic Leadership track: “Eye on Diversity & Inclusion: Developing Talent & Teams.” This session is aimed at providing attendees with practical advice around institutionalizing diversity and creating inclusive environments within your enterprise. Stay tuned to No Jitter for ongoing news on the Enterprise Connect conference program, including additional keynoters and more break-out sessions. Register now to take advantage of our lowest rate. As a No Jitter reader, you can even save an additional $200 off your pass price by entering the code NJPOSTS at checkout.